Fathom is excited to have Charlie on our team as an intern for the semester, here from the University of Connecticut. Coming from a journalism and radio background, we asked him some questions about what brought him to Fathom and his memories of his first concert (among other things). I made my first data visualization while I was interning at WNPR public radio in Hartford, Connecticut. I had recently switched my college major from biology and pre-med to journalism, and I thought I wanted to be a public radio reporter. Since I knew a bit of programming, I would help out with web tasks at the station when I had free time. I decided to teach myself D3.js, and ended up really liking building data visualizations. I think it’s kind of funny that my internship at a public radio station ended up pushing me to do something other than radio! How do you like being in Boston so far? I love it! Being in a city is a welcome change after two years in Storrs, Connecticut. Don’t get me wrong, Storrs is beautiful and I love UConn, but the thrill of passing farm animals as you walk across campus wears off fairly quickly. I grew up much closer to New York and I’m more familiar with that city, so I think I came to Boston expecting to still like New York more. I have to say that I’ve been pleasantly surprised. Lots of great food and cool neighborhoods that are easy to walk around. The title for this post fits well because I loved the MTA song when I was little. Fortunately, I haven’t been trapped on the MTA yet, though it does sometimes feel like it when I get stuck behind a disabled train on the way home from work. What do you enjoy most about working in journalism? I think the best thing about working in journalism is that it forces you to constantly learn new things. I’ve written stories on topics like coastal erosion, brownfield sites, and a fight between Yale and UConn in the late 1800s. I didn’t know much about any of those things when I decided (or was assigned) to write about them, so it forced me to read and learn about things I might not have focused on otherwise. I also like the way reporting lets you to meet people and go places. I’ve had the opportunity to report from remote barrier islands off the coast of Louisiana, interview people in costume at a Connecticut comic con, and spend a day with a competitive lumberjack team. The first time I remember actually going to to see music (as opposed to playing on the lawn with friends) was when I was eight or nine. My dad took me to see a band called Zox, which I guess you could describe as ska music with a violin instead of a horn section. A few years ago I realized that the concert was actually held in the auditorium of the high school in the next town over, which was weird because it definitely felt much cooler at the time. After that I saw Creedence Clearwater Revisited, which is sort of a Creedence Clearwater Revival cover band, except with the original bassist and drummer. Let’s be honest—having the original bassist and drummer doesn’t mean a whole lot. Things got better the next year, though. I got to see the Rolling Stones with Kanye West as their opener. I don’t think I was old enough to fully comprehend how cool that was, but it was awesome nonetheless. The Fathom team is excited to welcome Paul, our new designer and recent graduate from the Sam Fox School of Art at Washington University in St. Louis. We asked him some questions about design and typefaces (among other things). Who or what has inspired your design practice? Before studying design, I found inspiration in drawing, printmaking, mapping and typography. I didn’t fully consider the crossover between them, but at its core my fascination with art, language and maps is about creating systems for communication. They’re just different ways to translate information into a story. I’m most inspired by artists who explore and connect those interests: Xu Bing, Paula Scher, Piet Zwart, Hannah Höch, Julie Mehretu and Yanagi Yukinori, among others. In a big way, my family has shaped my approach to design as well. My mom’s a photojournalist, so while growing up I learned all about the world of the newsroom. Both design and journalism, at their best, require a critical eye and a commitment to telling the truth. My dad is a map designer—maybe my career choice isn’t a huge surprise! What are some of your favorite typefaces? I always enjoy reading in Mercury. It has a stylish, chiseled look that holds up well on the page and screen. 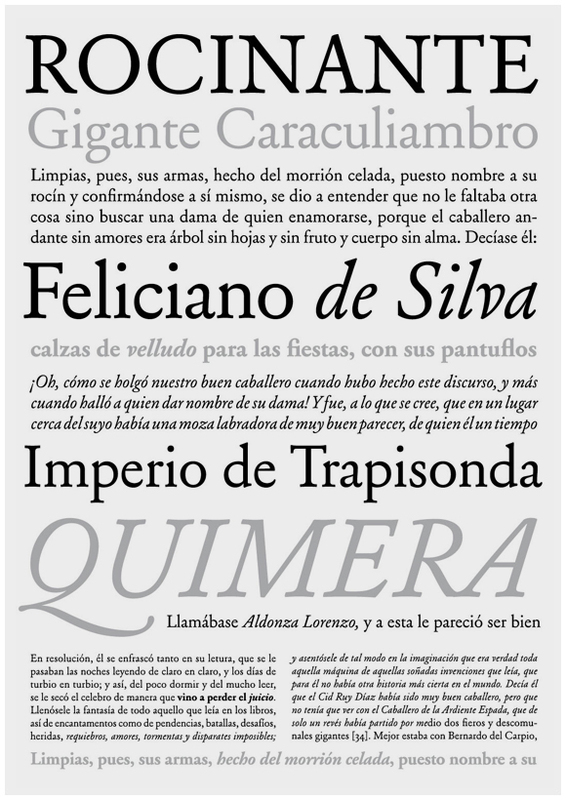 Other great typefaces for extended reading are Malaga, More, Quixote and Scala. I’d also recommend checking out the exciting and versatile work of Klim Type Foundry (designer Kris Sowersby). Akzidenz Grotesk is another favorite. It’s a classic sans serif and a real anomaly in type history. Typically you see it compared to Helvetica, which is ubiquitous and more streamlined as a design. But Akzidenz was created sixty years earlier (in the late 1890s, and based on even older faces) which makes it one of the first sans serif type families. From the shape of its letters you can see how designers were experimenting at the time, trying to invent ways to keep stroke width uniform across a collection of weights. So Akzidenz’s originality gives it quirks that Helvetica is missing. These features produce better readability and a surprising personality for such a corporate context. The elegant curves of the question mark and number 2 are especially nice. Typography confession: When I write, I always type as plain text in the default Mac editor (monospace, without formatting). I think it’s helpful to concentrate on the writing before bringing in a typographic voice. If you could redesign anything what would it be? Before moving to Boston, I spent some time studying the transit system while hunting for an apartment. (It definitely paid off to know that Kendall and Kenmore are different places!) It’s funny how Boston, like many other cities, tries to apply a Massimo Vignelli style to its wayfinding system, even though its geography is an organic network of squares — pretty far from a grid. Creating a complete transit map of Boston that stays true to the actual landscape would be a great challenge. I’ve started sketching a few concepts to see where it can go. It would be fun to droplift alternative posters at the station and see how people respond. On the other hand, I think Boston’s place names are perfect as they are. I commute on the Red Line heading to Braintree, which is a wonderfully weird image. I always enjoy fruit, especially dried mangoes. So far, I haven’t needed to bring in any because we have an excellent CSO (Chief Snack Officer) in the office. Fathom got started on one floor with just two people and two desks. Eventually our team grew and added a second floor, which became our official conference room. As we continued to grow in numbers, we also continued to explore other interests, often peripherally related to design, development, and analysis. Six years passed, and we realized we were using our conference room simultaneously as a classroom, workshop space, poster shop, 3D printing studio, kitchen, and living room. We knew it was time for a move. To find a new office that fit our needs, we had to take inventory of our team and our process. We needed to build a space that would allow our team to spread out and grow. I joined the group in March of 2016, with just enough time to get to know everyone before diving head first into a full office move. Over the course of seven months, from the initial buildout to the move, we put our skills to work: James designed the architecture and layout of the new space. I became an interior designer and spreadsheet extraordinaire. Dylan took over as impromptu moving day coordinator, and everyone became experts at building Ikea furniture. Mark even fessed up to having spent a few years working as a moving coordinator for corporate offices. We’re excited to see what unfolds in the new space as we continue to explore our projects and curiosities, and expand our team in Boston’s historic Beacon Hill neighborhood. Stay tuned for new visitors, talks, classes, workshops, and an amazing data-driven mural by our resident doodler, Rachel. I’m especially grateful to work with such a talented and dynamic team and can’t wait to see what’s next for Fathom.